I began this morning with hike into the East Inlet section of Rocky Mountain National Park to photograph sunrise. While hiking in long before dawn I ran into 3 sets of eyes on the trail. These 3 sets of eyes happen to be two adult moose and this calf. I paitently waited for the family of moose to move off trail so I could proceed to the East Inlet prior to sunrise. Eventually the group of moose moved off into the cover of the forest and I continued on to the East Inlet. While photographing a beautiful sunrise that morning, this family of moose meandered out of the forest and back into the meadow of the East Inlet close to where I was setup photographing sunrise. I gave the moose plenty of space as I retreated from along the banks of the river to a safer location near the trail where I could safely photograph these animals without disturbing them or putting myself in harms way. 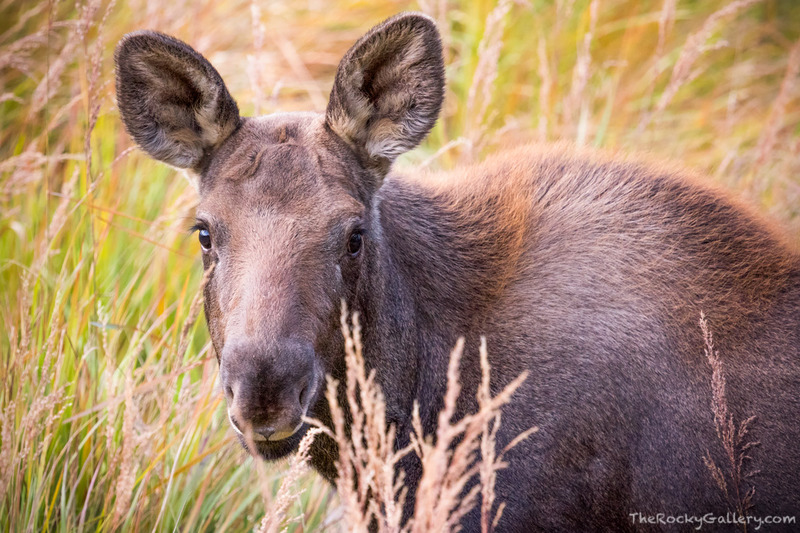 This moose calf stayed close to it's mother but eventually wandered out just enough to allow for a quick portrait of this shy but adorable creature. Photo © copyright by Thomas Mangan.